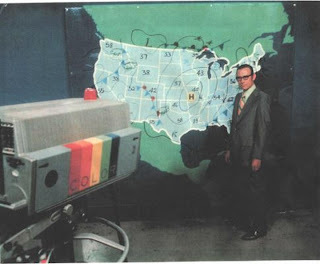 I originally posted this tribute last August but it is time to revisit my original weather hero. Many of my friends and some of my teachers in high school called me "H.D. ", because I was an H.D. Bagley and weather enthusiast. Last night I came across of a clip from 1993 when Meteorologist Tim Simpson (then with WHNT 19 in Huntsville; now with WREG Memphis) interviewed H.D. during his weather broadcast. Below you can see that video. Below that is an actual broadcast by H.D. from the late 1970's. This one is really a treat! One of my favorite weather people of all time was H.D. Bagley. Fortunately, I had the distinct pleasure of meeting him in April 2004, a few months before he passed away at age 87. My boys and I attended the 30th anniversary memorial of the April 3-4 Superoutbreak at Athens State University in Athens, Alabama. H.D. was there, along with a "who's who" of Alabama weather folks. After the presentation, I introduced myself and my boys to Mr. Bagley. He looked at each boy and asked their name and age and said, "Which one of you are going to be a meteorologist?" I remember Mr. Bagley as the most consistent, reliable weather voice on television in North Alabama throughout the 1970's on WHNT Channel 19. He guided our community through numerous severe weather outbreaks with reliable information, calmness, sincerity, and class. He always ended his Friday weather broadcast with, "Wherever you go, go to church on Sunday." The Huntsville NWS Office has a set of pages dedicated to Mr. Bagley that includes numerous historical photos, many taken by Mr. Bagley himself. This page was compiled by Daniel Lamb. Finally, here is a photo I took of Mr. Bagley on April 3, 1974. That was the day I finally met him, but sadly it was not too long before he passed away. When I was in Jr. High at Chapman, kids called me H.D. also. It wasn't because I was a weather buff though, I'm his younger son. Great tribute. Where can I get the videos you used to have? Thanks, Bert B.